हेल्लो मेरे प्यारे दोस्तों, कैसे हैं आप सब? 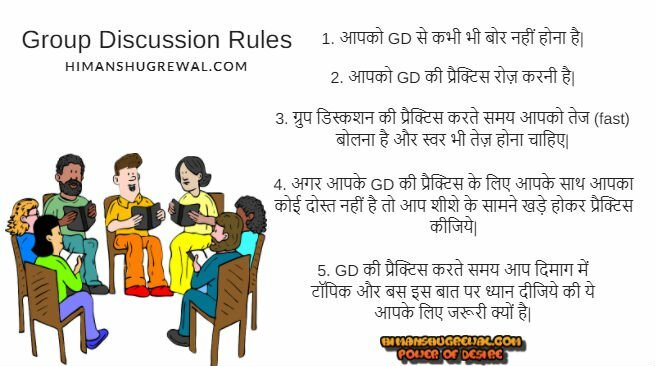 दोस्तों आज मै आपको कुछ Group Discussion Rules and Tips बताने जा रहा हूँ जो की ग्रुप डिस्कशन राउंड के लिए बहुत अच्छे और महत्वपूर्ण भी हैं. मेरे दोस्तों आपको लग रहा होगा की कितना बोरिंग टॉपिक है ये group round discussion. राईट? दोस्तों आपको इससे कभी भी बोर नहीं होना चाहिए|. दुसरो को इम्प्रेस करने की वजह से आप new words सीखते हो. देखा आपने, GD की प्रैक्टिस करने से आपको कितने फायदे होते हैं, एक साथ 4 फायदे| अब तो आप ज़रूर बोलेंगे की आपको GD ही करना है. 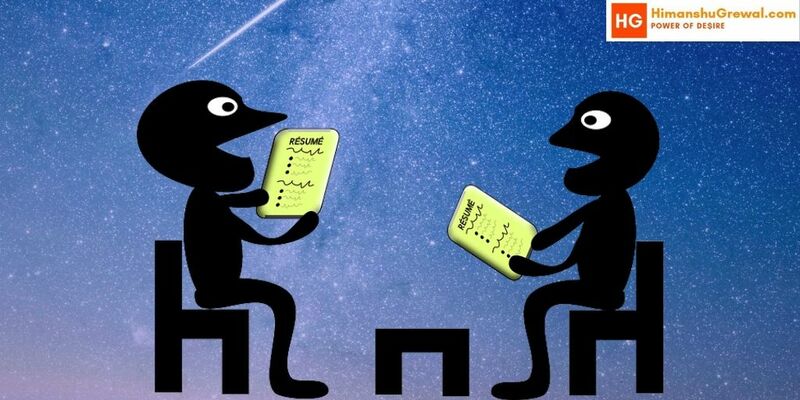 दोस्तों अगर आपने interview के लिए apply किया और आपको GD की आदत है तो आप अच्छी स्पीच भी बोल सकते हैं. दोस्तों हमेशा की तरह पहले मै बोल के दिखाऊंगा, उसके बाद आपकी बारी आएगी और याद रहे हमेशा आपको ज़ल्दी-ज़ल्दी बोलना है, तभी आपकी group discussion skills improve होगी. My Turn ⇒ Hello, this is me Himanshu Grewal. I would like to participate in this GD. It’s market selling price is very low. It cost only 4rs. In today’s world every one can buy this. We get all type of news together in newspaper, Like national news, international news, sports related news etc. Your Turn ⇒ (Speak Negative)………………. दोस्तों ये थे कुछ Best Tips for GD. आपको बस इन पॉइंट्स को याद रखना है और अपने टॉपिक से रिलेटेड thoughts आपको बोलना है. कोशिश कीजिये की आप अपने सामने बैठे व्यक्ति को अपनी बातो से नीचे कर दे. दोस्तों मेरे पास प्रैक्टिस के लिए और भी Latest topic for group discussion हैं जो आपकी skills को और बेहतर बनाएगा, बस आप अपनी प्रैक्टिस ज़ारी रखिये. मेरे दोस्तों आज का ये आर्टिकल यही समाप्त होता है, अगर आपको अच्छा लगा हो तो अपने दोस्तों के साथ शेयर करना ना भूले| Thanks for reading this article of group discussion round. Koi whatsapp grp nhi h kya sir ka . this is very important topic………. English is very interested and very important language for you and for everyone. english is a medium of communication . which helps to transfer your thoughts into the correct medium. But it is not to be compulsary to speak or talk in english language everywhere. 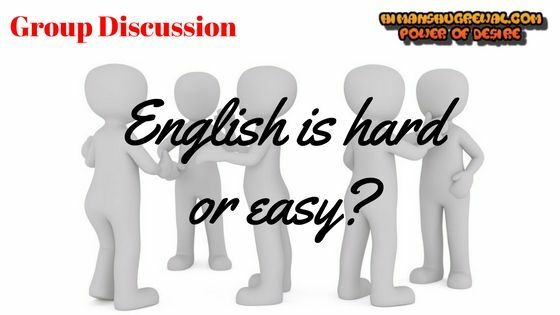 Really English is very important and very interesting subject…..
English language is very necessary in our life. And really English is very interesting subject. But our youth wants easy success and someone make hard practice those got it. Sir, I am impressed by your work. english is most important language in the world . According to me.News paper is Batter then T.V.Because new have a good pawor to improve our english.and then speak english.Every persons have a Desire to Improve our english quickly…that’s why we shold read very well English..
according to me TV and newspaper both are good at own place. But TV is better for understand of any kind of news by see as both. And one more thing better in TV ie in newspaper we get any news on Nxt day. But on TV can be get live S as me time.now a big difference bw TV and newspaper ie we can entertain ourself by TV by movies music etc etc.. But not on newspaper. Wese mai guest post approve nhi karta hu only sponsord post accept karta hu par Agar aap 3000+ word ka article publish karna chahte ho to aapka welcome hai. I have huge traffic. Mai bs 1 link hi approve karunga isse jyada nhi. Are you agree ,write your WhatsApp no. आपका स्वागत है. सबसे पहले आपको टेंस सीखना चाहिए उसके लिए आप इसे पढ़े => Tense in Hindi with Examples – टेंस क्या है -> काल -> समय ? But cannot in front of new people. How to remove my shyness? This is mohit Tiwari . I read some comments about this page. Many people are interesting in what’s app group discussion. I am also want it. If any body are interesting in this then reply me for it on my what’s app…. According to me news papers is good because we read and better understand and today life everyone can bay news papers his cost only 4 rupees and I think then we read news papers and our thought ability better then we read news papers then we read only news and then we open the T.V that not sure we see only news and T.V is very costly and not everyone bay him and Electricity very important for T.V then cut the electricity and we don’t some. In my opinion TV is better than newspaper. In today’s busy life people are always in a rush, so they can watch the news on TV while reading newspaper will be time consuming for them. Moreover TV is also a better mean to them who are illiterate because they are unable to read so they can much aware of the world by just watching the news on TV . News on TV is much entertaining. To read a newspaper one needs undivided focus. So watching news on TV is more convenient. need to tell in front of crowd or other places, i forget all the words.. How i impove it?